Here at Rocscience, we’re always looking at ways to make the visualization capabilities of our software even better. So, we’re especially excited to share with you how we’re bringing the immersive qualities of Augmented Reality (AR) into our 3D modelling products through integration with Microsoft HoloLens, the leading headset in the AR market. The Rocscience HoloLens Extension to Slide3 and RS3 is seamlessly integrated with the UI through the addition of a toolbar. Simply select the geometry you want to visualize and click a button to export it to the headset. The model is now “in the room” and can be “found” and “viewed” by anyone wearing the headset. Because it uses AR, HoloLens superimposes the image of the model over the real world that remains visible through the lens. This gives the wearer the feeling of immersing themselves in the model and experiencing it “live” without losing sense of their actual surroundings. Thinking of the visualized model as being “in the room” is a pretty accurate way of describing the wearer’s experience. When visualizing a 3D model on the screen, the viewer is stationary and manipulates the model to view it from different angles (Zoom, Pan, Rotate). 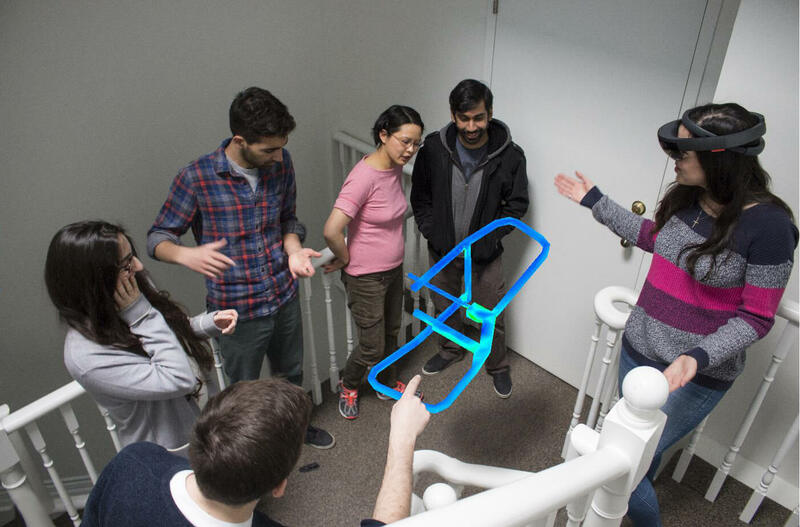 With the unique capabilities of HoloLens, it’s the viewer who moves, able to “walk around” the model to see it from every angle, even from above and below. In fact, in the case of an excavation, the viewer can “walk into” the model as well as walk around it. But HoloLens lets you have it both ways, with an added treat. Just like the UI in Slide3 and RS3, you can remain stationary and use the toolbar to transform, rotate, and scale the model. The added treat is that you can do this using your hands so, even here, your interaction with the model involves multiple senses. There’s no question that HoloLens is an innovative and promising piece of technology and that its integration with Rocscience software offers many exciting opportunities for transforming the way our customers create and visualize models to better understand, analyze, and fine-tune their designs. For example, we can see how making it possible for multiple HoloLens wearers to interact with the same model has the potential to boost communication, collaboration, and problem solving within teams. We’re still in the early stages of development and are eager to explore the many potential use cases and applications of this new technology. If you have suggestions for potential uses for the Rocscience HoloLens Extension, we’d be happy to hear from you via email. We’re taking the HoloLens to conferences around the world so that you can experience it for yourself. Keep an eye on our LinkedIn, Twitter, and Facebook channels to find out where HoloLens will be next.